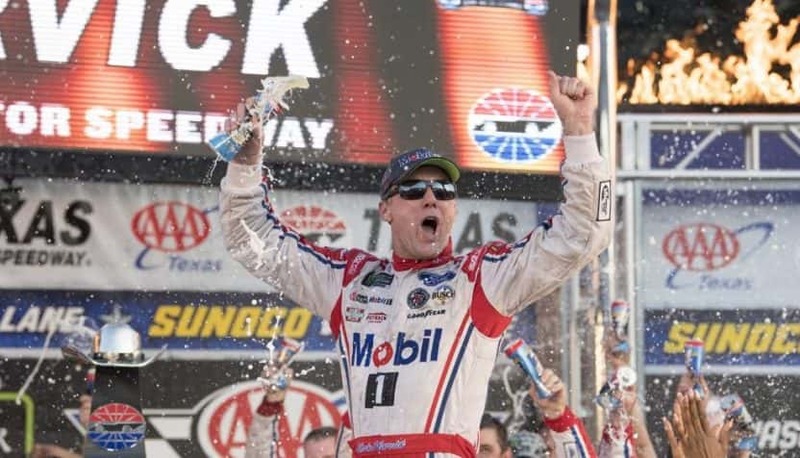 It was Kevin Harvick all day long into dusk and overtime Sunday at Texas Motor Speedway, where the Stewart-Haas Racing star won the AAA Texas 500 for the second consecutive year. Harvick’s eighth win of the season provided him an automatic berth in the Championship 4 round of the Monster Energy NASCAR Cup Series Playoffs in two weeks at Homestead-Miami Speedway. He and Joey Logano have locked in two of the four positions by virtue of victories in the current Round of 8 segment. Harvick, who swept the first two stages for a clean sweep of the day, outran Ryan Blaney on a green/white-checkered overtime restart after the day’s eighth and final caution to prevail by 0.447 of a second. Choosing the outside lane for the OT restart, Harvick rocketed past Blaney and steadily pulled away to his second consecutive win in the AAA Texas 500. He also led a race-high 177 of the extended 337 laps. With the two-lap overtime shootout looming, Harvick and crew chief Rodney Childers chatted about one thing and one thing only – execution, execution, execution. 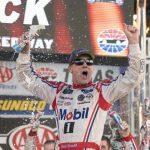 “It was a big day for all of us, for me on the restarts and to win the race on the restart late at the end,” said Harvick, who went 29 career races at Texas Motor Speedway before his first win came in the 2017 AAA Texas 500. “The guys on pit road had a solid day and gained spots on pit road and Rodney made great calls. All around, just a great day of execution. Blaney, who is not involved in the Round of 8 Playoff scenario, settled for second by holding off Team Penske teammate Joey Logano, who settled for third. Logano clinched his Championship 4 spot with a victory last Sunday at Martinsville Speedway. Harvick and Blaney were the protagonists on restarts following the day’s sixth, seventh and eighth caution periods beginning on Lap 298. Harvick won two-of-three of those restarts heading into the wider and reconfigured Turn 1-2 area that now is banked at 20 degrees after a repave following the 2016 season. Turns 3 and 4 have remained banked at 24 degrees. “We got by the No. 4 (Harvick) on that one restart (after the seventh caution) but I just couldn’t hold him off,” said Blaney, who started on the pole in the No. 12 Accella/Carlisle Ford. “He was really good. I kind of missed (Turn) 1 and 2 by an inch and he took advantage of it. We needed to be mistake-free and then some, and I just couldn’t be that. Then we had another shot at it. Harvick’s 177 laps led total was a staggering 123 more than the 54 racked up by Logano, who was booed heavily during pre-race introductions following his controversial bump-and-run win over Martin Truex Jr. on the final lap on the half-mile Martinsville oval. Those final two spots will be settled at the reconfigured 1-mile ISM Speedway in Avondale, Ariz., near Phoenix next Sunday. While Harvick’s win means he won’t have to count points at ISM Raceway, he is the leader by 15 over Kyle Busch of Joe Gibbs Racing. Busch finished 17th and on the lead lap after going two laps down earlier after dealing with a bad set of tires on his No. 18 M&M’s Toyota Camry during a pit stop on Lap 142. Busch is three points ahead of Truex Jr., the reigning Cup Series champion who finished ninth after a day that included a penalty for driving through more than three boxes on a stop on Lap 248. That dropped the No. 78 Bass Pro Shops/5-hour ENERGY Toyota to 26th. Truex Jr. managed to get back onto the lead lap during the sixth caution on Lap 298. Kyle Busch and Truex Jr. currently occupy the two final transfer positions to the Championship 4 based off points going to Phoenix. Kurt Busch is fifth, 25 points behind Truex Jr.
Elliott (-39), Almirola (-57) and Bowyer (-73) face a must-win scenario at ISM Raceway. “Yeah, we’ve got to win,” said Elliott, a three-time winner this season, including two in the previous playoff round. “Simple.